What they promise: “Easy to use, lots to choose.” All-day crease-proof wear, four coordinating shades with step by step application guide. Comes with two velvet-tip applicators for effortless and smooth application, that blends without tugging or pulling. Safe for sensitive eyes and contact lens wearers. Ophthalmologist-tested. 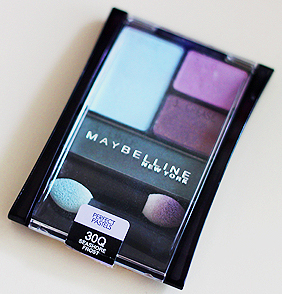 Maybelline really is a go-to for affordable and quality makeup, and from my day-to-day usage I’ve found the Expert Wear quad really does stay true to what they claim. With 14 different shade combos to choose from, you can definitely find your favourites and what works best with your skin/eyes. The colour combo of Seashore Frost is a bit too dramatic for school or work, but if you just use the lid and crease colour (which are pinky mauve-ish colours), they are great! It lasts long (eye shadow primer is key!) and the colours are very pigmented and vibrant. So for just a little over $5 and four shades, it’s definitely something to try out!